My Dogs Dig It! » Why do they all want to drink out of a tiny green bowl? Something interesting has happened recently. All four dogs have decided that drinking out of a tiny green bowl is the best idea. 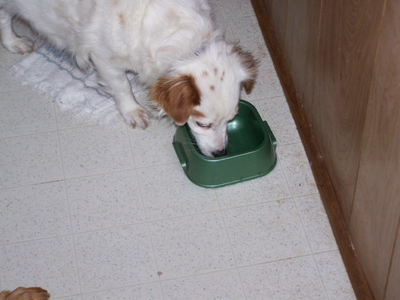 Originally, I bought this 99 cent bowl when we rescued Lexie. (formerly Plum) After she was adopted, my mom and I put the bowl in the kitchen because Valerie kept trying to reach and drink out of Janko’s raised feeder and there wasn’t a little bowl in the kitchen for her. Now ALL the dogs have decided that this tiny 8 oz bowl is THE BOWL to drink water out of. What’s really hilarious is watching Janko try to drink out of it. Actually, tonight, he basically pushed the girls out of the way to stick his big snout in there right after I filled it—FOR THE GIRLS!!! I just don’t get the fascination with this bowl. It’s not like I don’t have 4 other water dishes in the house.